1 photograph : b&w ; 4 x 5.5 in. - 1 photograph : b&w ; 3.75 x 5.75 in. 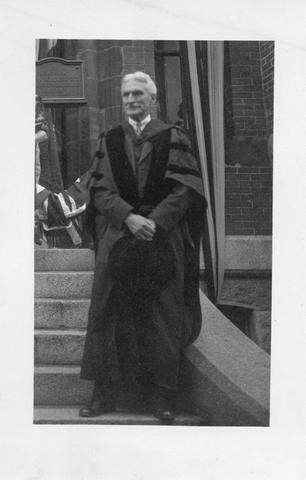 Item consists of two copies of a photograph taken during the unveiling of plaques in honour of Dalhousie University's first three presidents. The photograph shows Arthur Stanley MacKenzie standing on the front steps of the Forrest Building and wearing academic dress.